There comes a time in the life of every knitting project when you contemplate frogging it (this is what knitters call it when we take our needles out and rip out many rows of stitches. It’s called frogging because we rip it, rip, it. Get it? 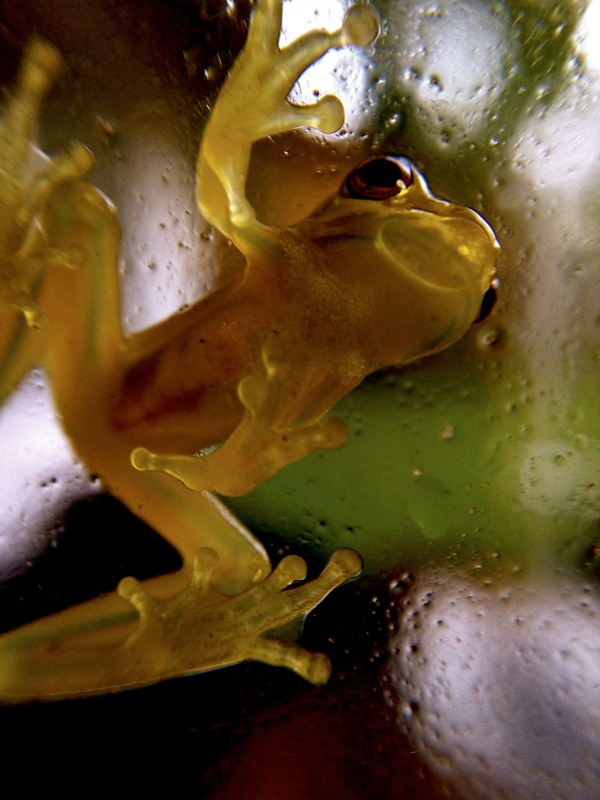 Ribbit). Perhaps it is boring. Perhaps your original reason for making the project is no longer relevant. Perhaps you have come to an obstacle that you don’t know how to overcome. Perhaps you didn’t swatch or your swatch lied and the combination of yarn, needles, and pattern aren’t working together. I’m not afraid to rip out my work and ‘lose’ the time I put into the knitting so far. Many people try to classify themselves as either a process knitter (a person who picks projects based on the skills involved in making it) or a product knitter (a person who knits to get the finished object). I don’t see this as an either / or proposition, but as a continuum. 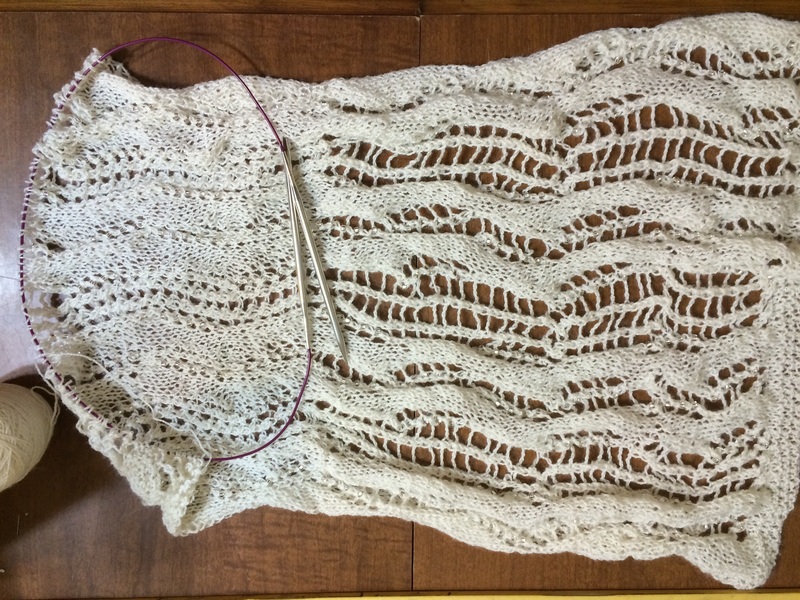 I very much enjoy the process of knitting — and this includes the entire process of knitting, including swatching, purling, cables, lace, blocking, etc. You will never hear me say I hate any component or skill in the knitting universe, because I see it all as one part of the whole that is knitting. Even when I’m ripping out. While I am invested in the process, I also care about the finished object. I pick projects based on a number of criteria. Sometimes I pick them for function. Sometimes I pick them because I want to learn the skills that the pattern incorporates. Sometimes I just need something mindless or quick. Sometimes I’m trying to use up a particular yarn in my stash. Whatever the reason I pick it, I want it to be beautiful, useful, and functional. I want my work to exemplify craftsmanship. My attitude towards frogging is also informed by my experience as a cake decorator. I’ve made many beautiful cakes that people are afraid to cut. I take the knife and hack away, obliterating many hours of work in a few moments. In the case of cake, destruction is the only way to get to function — the primary purpose of cake is pleasure in eating. The decorations are beautiful while they last, but should not be an obstacle to the function. I can’t be attached to them or the primary purpose of the work will be lost. While frogging isn’t always required to get to function in knitting, there are times when it may be necessary in order to achieve beauty, usefulness, function, and craftsmanship. And it is just another part of knitting. So I’m pretty Zen about the whole thing. If it needs to be done, I’ll do it. Still, there’s no need to be rash. When I get to the point where I’m contemplating frogging, I will set the project aside for a while. When I come back to it, I’m no longer in a moment of frustration and I might be able to see a different way to solve the problem. This is what I did with Liquid Silver. I first noticed the problem with it a couple weeks ago, and wrote about it in a WIP Wednesday post. You might recall that this project sat for several years. The problem I noticed was that my gauge has changed in the intervening years. You can clearly see the line between the old knitting and the new knitting. This is not a problem that will be solved by blocking. The only solution is to frog it and start over. This is particularly challenging because there’s so many beads in the shawl. Every wrong side row has 6 or 8 beads. I estimated that the shawl has 300 to 400 beads in it already. I didn’t want to lose the beads because I plan to cast on again. 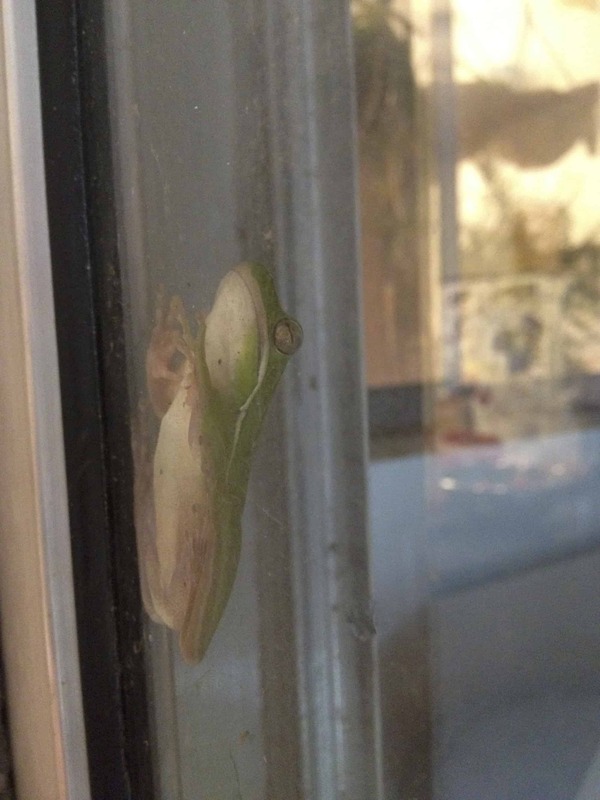 So I came up with a solution that would be relatively quick while keeping the beads from flying everywhere — frog in a box. And I made a video so you can see how I did it. So it’s done. I’ll cast it on again sometime soon. P.S. 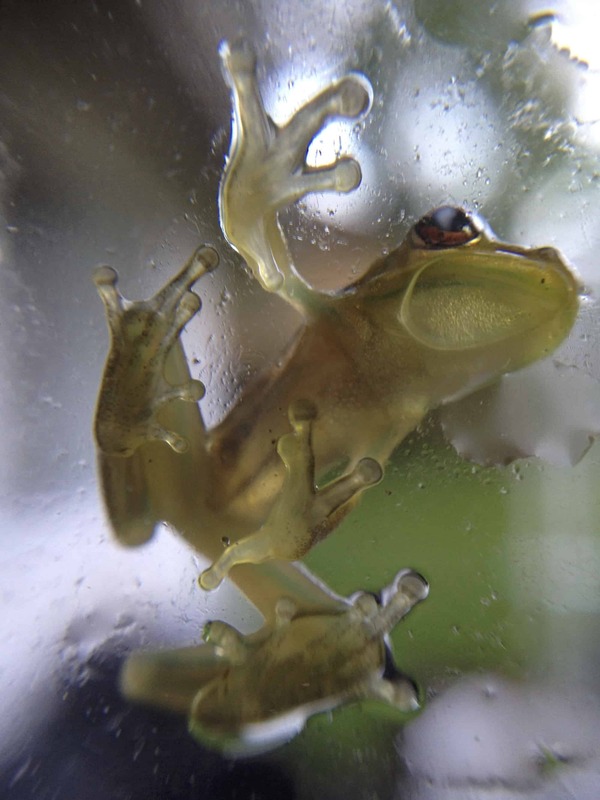 I hope you enjoyed the frog pictures. I love frogs, as you may have guessed from the fact that my Ravatar is always a frog. I personally took all the pictures in this post in my own backyard. 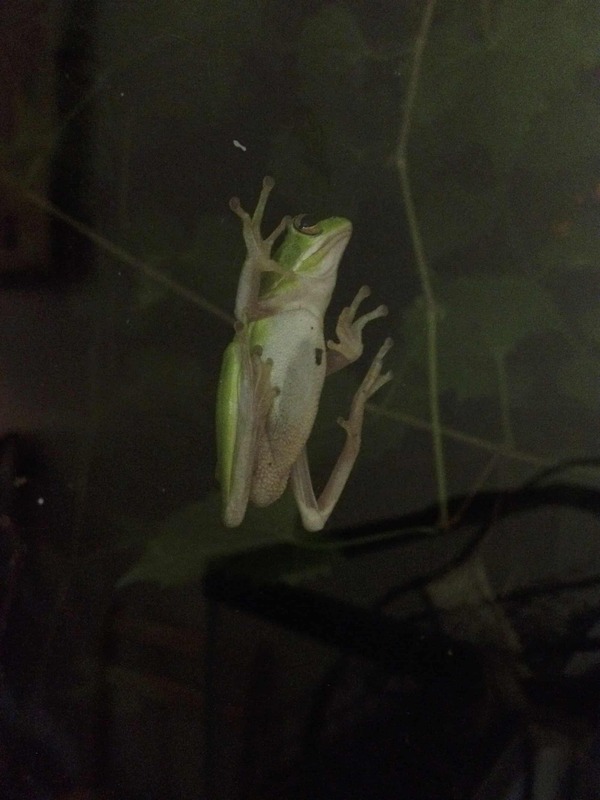 We have lots of tree frogs around here, and during the summer they are always on our windows and sliding glass doors. There’s something so vulnerable about their soft little bellies and I find this adorable. I’m always trying to get good pictures. 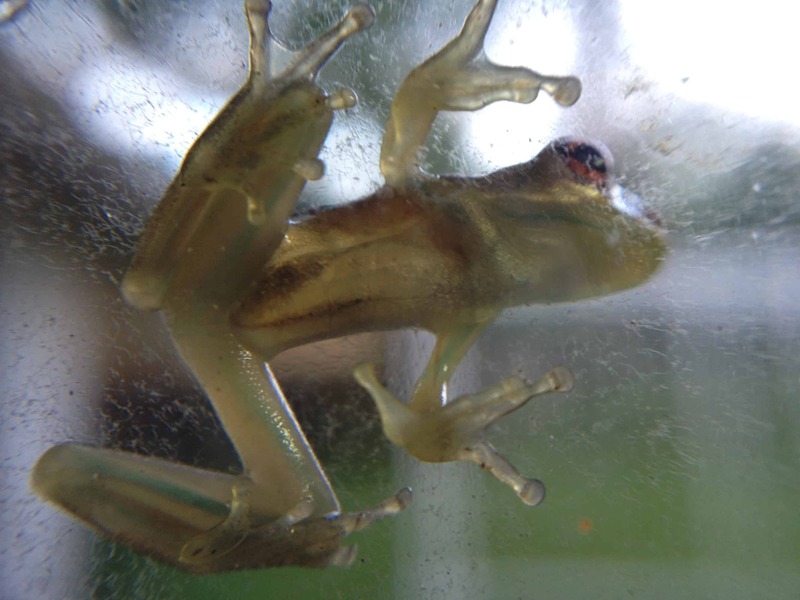 It’s a challenge because the frogs are usually out at night so natural light isn’t available and the flash bounces off the glass that separates me from the frogs. The pictures in this post are among the best I’ve gotten so far. Interesting blog post. Love the pictures that go with it. The first picture looks like a sketch. 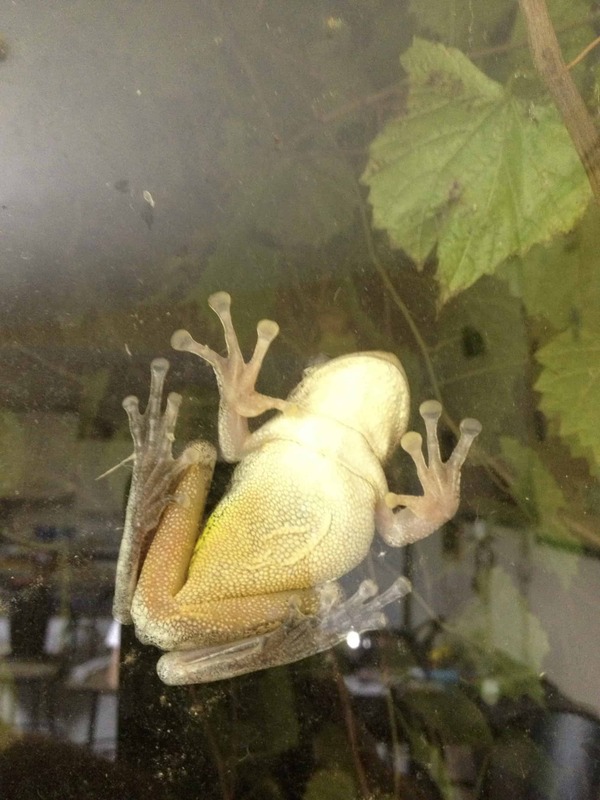 Great idea for frogging – never thought to frog directly to my ball winder. This post is a metaphor for writing. I have to do a rewrite and was discouraged. Now I will think of it as frogging.